Vodafone have recently released their new Vodafone Blue handset here in Ireland, specifically for all the Facebook nuts out there, as their own answer to HTC’s Facebook handset being run exclusively on O2. One landed on my desk a few weeks ago, so I decided to play around with it. 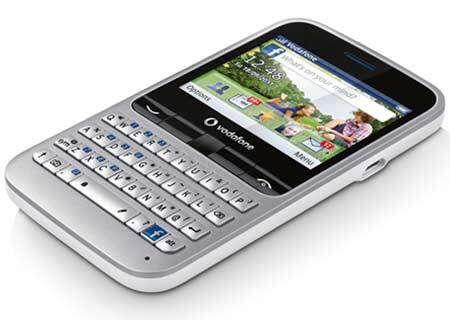 First impressions are a bit reminiscent of a BlackBerry from maybe 3 years ago, there’s a lot of buttons laid out across the handset with a sizable enough screen for the handset’s size in standard QWERTY, with the addition of the Facebook button along the bottom. The menu buttons along the top are a little more confusing, besides the standard call answer and drop buttons, there’s a touch-joystick in the middle which takes a little getting used to when you’re used to gesture based touch screens, there’s also two buttons to either side, which although are not labeled are menu option buttons. Running on a custom OS, it’s not too bad, and certainly has enough features for the basic end user. With Facebook instantly accessible and a mediocre camera for updates on the move. Other than that it’s almost indistinguishable from any other Nokia handset for example, while this isn’t exactly a bad thing, it’s not something to go shouting about. I can see where the market for the handset it, for young people who don’t have the finances or the inclination to get a full fledged smartphones but want to keep in touch and use the social benefits which one can give. One major problem, which I had with the handset, was, typing. The buttons are far too small, and for some reason typing ‘c’ also gives me an ‘e’ which I still cannot understand, it might be a handset setting, but why such would exist is beyond understanding. The OS is also clunky, with a poor response from the joystick it was tedious finding my way around. Perhaps it might be easier if I hadn’t come from using an iPhone or Android, but it was a bit of a pain. Overall, the idea is good, but the handset feels like something, which would have been released to the low end of the Market maybe 5 years ago. You could do much worse than this handset, while I did have a lot of trouble with it, the OS felt simple enough and reliable. Perhaps Vodafone should leave Facebook phones to the guys over at HTC, but if you’re looking for a phone to give you on the go Facebook access, you may as well fork out, or wait until Christmas for an iPhone, or the excellent HTC Sensation, you’d get faster, more intuitive access with less hassle and a bettered camera. The Vodafone Blue Facebook phone is currently not available in stores, but you can register your interest on their Facebook page.